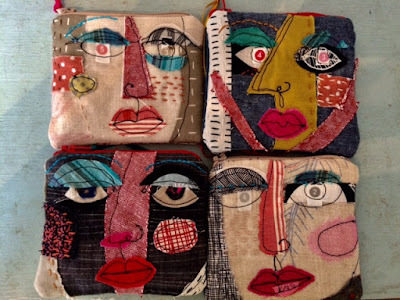 Carol Smith's Picasso-esque purses. Love these! I was very pleased to welcome these purses made by Carol Smith at the shop on Saturday. Carol is an multi-talented artist who draws monoprint cards for the shop and makes brooches and zipped bags using applique and machine embroidery. Famed for her middle-aged fairy brooches for Christmas and you may remember the large bottomed lady struggling to do up her bra which the shop has sold as a picture and a brooch. These zip up, lined purses pictured above are on sale for £18.50 each. I also like these rustic wood bowls, turned by Neil Pafford. Neil saw a man operating a primitive self-built lathe at Singleton Open Air Museum and once home, built his own version on which he made these bowls. There are five of them in the shop. Four at £15 and the biggest, which could be used for salad, at £20. 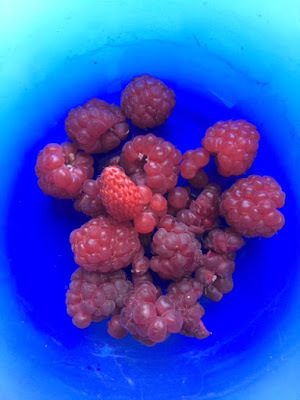 I don't usually publicise events which are nothing to do with the shop but the woman running Grow Your Own workshops for children in the summer holidays seems so nice I have a feeling children will really enjoy them. Wouldn't it be blissful if your children or grandchildren got so fired up at the thought of growing vegetables for the family that they took over part of the garden to do so! So on the hottest day of the year I made Christmas decorations in the shop. I had a vague picture in my mind of a beaded textile decoration sprouting ribbons and possibly beads as well. These decorations are slightly different from one another and I now know where I'm going with this and what repeat decorations will basically look like. Once I've made a quantity of these I'll focus on making some garlands and maybe a small version of this shape could be a bead in a necklace as well. I am grateful that I have a fan in the shop otherwise it would be very difficult to function. Tomorrow we are promised rain. Fingers crossed it comes and breaks this cycle of heat and humidity. Advance warning: Family need me on Saturday August 4th. Not this Saturday, the following Saturday. After some thought I've decided the shop will be closed on that day. So on Saturday August 4th don't visit the shop because it will be closed. I'll remind you again nearer that date. Leaves made 3-D like brazil nuts. I hate puting a picture up without a credit but I just want to share my Christmas inspiration with you. Thinking about the year so far with the total mess up that Brexit appears to be and the general lack of confidence in a brighter future I feel that Christmas should be a colourful, joyful celebration this year. A chance to enjoy being with family and, just for a few days, to not worry about what lies ahead. I made the leaves in the first picture by deliberately puting together the bright colours of Holi Festival. Then I tried joining some of them together with the idea of a three tier decoration, largest to smallest adorned with beads and ribbons. I haven't added the beads and ribbons yet. I'll try that in the shop this week and show you the results in the next post. Meanwhile I think I need a powerful fan to provide a cool breeze in the shop as it's getting hotter. A childhood memory is of us kids jostling round the tree in the playground where the thermometer hung. If it hit 100 degrees farenheit (37.778 degrees celsius) our parents could come and take us home. I was about 7 and we lived in the Middle East. When it was really hot my mother sat my younger brother and I in a cold bath. This is what the outside of Handmade Happiness looks like. The building is 400 years old! Yesterday a friend came in carrying a box full of bunches of sweet peas from her daughter's garden. Their scent filled the shop. Sweet peas. along with delphiniums, larkspur and roses are my favourite flowers and it was a total joy to have some to sell. All but two bunches sold out immediately and I was pleased to be able to take the last two bunches home with me (first picture). Pictured above: I'm embroidering a t-shirt in quiet moments in the shop. Above: Kate Box's gorgeously soft baby blankets for sale in Handmade Happiness. I made a dozen carrier bags from old Harpers Bazaar magazines this week that a lovely customer gave me. For some reason the more bags I make the more stock I sell. For nearly 7 years I've been making all the packaging materials for Handmade Happiness, carriers from the covers of magazines and paper bags from the inside pages. This year I've also stopped buying bubble wrap which up until recently I used for pottery sales and to wrap pictures. I don't want to have to buy anything plastic and again a customer has stepped in and is giving me thick packaging paper for wrapping fragile stock. I enjoyed making the velvet buttons and have a stock of them for colder months. Now I'm embroidering a t-shirt - I want to cover the front with embroidery. I also made a necklace for the dress I wore for the Petersfield awards night on Friday. Handmade Happiness was shortlisted for Best Shop.I had decided in advance that it was unlikely that Handmade Happiness would win and I was right. It didn't win but as they say, it's the taking part that counts! Justine Jenner has just delivered examples of her latest pottery designs to Handmade Happiness. Justine's experimental work with matt glazes is truly special and her work is colourful and 'of the moment'. Pictured above are just two of Tanya Williamson's many textile pictures in the shop now. These make ideal little presents. Some months ago I told you that Handmade Happiness has been shortlisted for Best Shop Award. On Friday night the actual winner will be announced. I will let you know who wins. But picture me at the awards ceremony with a stiff smile on my face - like a Petersfield version of the Oscars when nominees have to put on a brave face on hearing that someone else has won - and then heartily congratulate them!!! On my day off I walked round Midhurst and if I closed my eyes I could imagine being in a desert with the sun beating down on my head! I found the pretty embroidery book in Midhurst and a useful set of drawers for shop display. 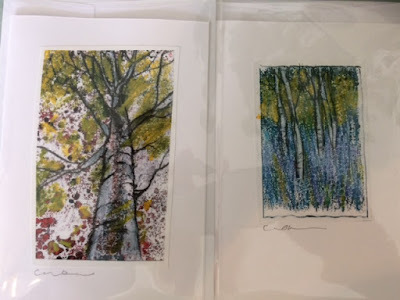 The shop has been busy lately and it's good to have some new stock like these monoprint cards with pastel that local artist Carol Smith has just brought in. These pretty tea towels were being sold to benefit a charity. This is what I bought at the Country Brocante Fair at Midhurst on Friday. I love the tea towels and I'm wondering if Ikea sell something I could frame them in. For my house, not for the shop. Pictured above, the little heart from Harriet's Attic is beautifully made and I love the vintage French (?) fabric chosen. 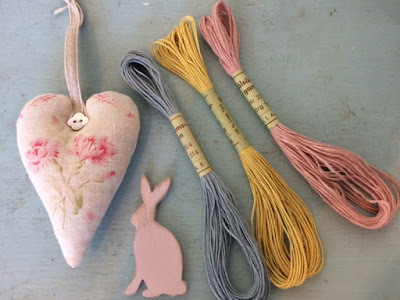 The bunny from Trunk is just the right shade of pink and I plan to have similar items from those makers in the shop soon. Something else I'd like to have in the shop are Rosehip's calligraphy tags. These are beautifully written words on watercolour paper with a vintage fabric tie. Watch this space. I could have happily returned to this Fair yesterday. So much to see that after two full marquees I knew I wasn't giving my full attention to the stands that came after. But I am always happy to be in the Handmade Happiness shop, talking to the lovely visitors that come through the door and yesterday it was very busy. When not serving customers I am embroidering a white t-shirt. It's slow progress but I hope to be able to put it in the window soon!